IMPERX 10G is here! Come See it in action at VISION Messe Stuttgart 2018. From November 6-8, 2018, Imperx will showcase camera solutions for the most demanding Industrial and Machine vision applications at the VISION 2018 show. 10 Gigabit Ethernet, or 10GigE, is the newest interface for machine vision applications. Imperx proudly adds their 10GigE cameras to their product mix and presents its 10G CMOS cameras with 31MP and 25MP resolution at this year’s VISION show in Germany. 10GigE benefits include: excellent speed and distance, quick and simple setup, reliability, backwards compatibility with GigE, efficient CPU usage, GigE Vision compliance, and more. camera. This GigE and PoE camera combines a tiny form factor with the advantages of the Sony IMX265 CMOS sensor. Due to its small profile and excellent sensitivity coupled with wide dynamic range, this Imperx camera can be integrated easily into existing systems while providing a full feature set with upgradeability. It is especially well suited for cost-sensitive industrial application fields. Imperx, Inc. will illustrate the polarization features of its 5MP Cheetah camera which helps eliminate glare from reflective surfaces and can help visualize internal tension/stress within transparent materials. Available in color or monochrome and featuring the advanced Sony Pregius IMX250 sensor with global shutter technology, the camera has excellent sensitivity and exceptional dynamic range with fast frame rates in a small form factor making it ideal for a wide variety of uses in the world of machine vision. 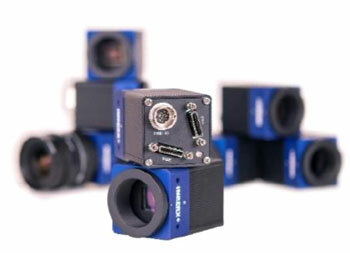 Visitors to Imperx’s booth (1H81) at the VISION show can examine Imperx’s newest camera lines: the Cheetah and Tiger camera families, as well as our high-resolution Tiger CCD models (up to 47 megapixels). This broad product portfolio offers appropriate solutions for even the most diverse demands and applications. Experts from Imperx will be available for questions regarding camera solution and will be happy to help you with proper camera selection.